However it would seem there is nothing fraught about commemorating Francis Drake, England’s forerunner of Hörst Börme and Adolf Diekman. Summer is the season for massacres. (Bloody Sunday 1972 excepted) Tianemen, Sebrenica. Hörst Börme was responsible for the massacre of 300 men women and children in the Czech village of Lidice in 1942, apparently under direct orders from Hitler and Himmler. On the 36th of July 1575 an English force under the command of Francis Drake and John Norney were ordered to attack the castle on Rathlin Island, a place of refuge for the followers of Sorley Boy McDonald. The island, veacause of its association with Com Cille, had hitherto been respected as a place of refuge, a sacred sanctuary, and was host to the wives and children of the followers of Sorley Boy and to many elderly and sick. The castle on the island was only lightly defended ; after a captain, the commander of the defending forces, was killed the constable of the island sued for terms of surrender.. The constable and his family were allowed to leave as was one other person. The rest of the garrison were butchered, 200 in all. In addition 400 non-combatant men women and children were hunted down and slaughtered by Norney’s troops while Drake held the entrance to the harbour to guard against a rescue attempt. Thete were no protests made or enquiries ordered after the Rathlin massacre and no misgivings expressed. On the contrary the Earl of Essex,who with Henry Sydney had ordered the attack, later exulted that Sorley Boy had been forced to watch the massacre helplessy from the mainland and was “like to run mad from sorrow”. 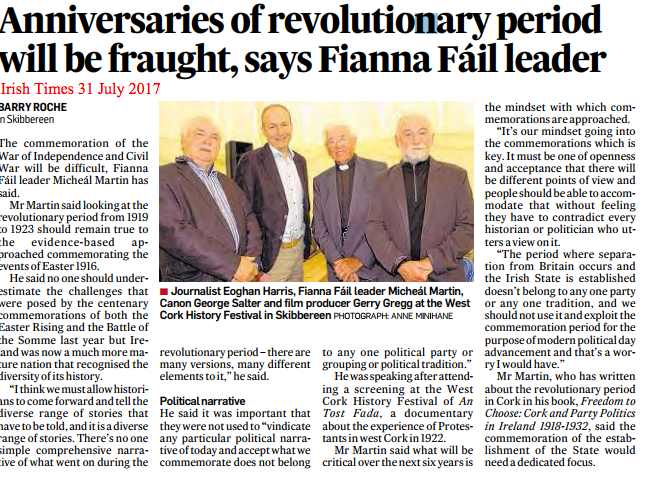 Some years ago Micheál Martin, leader of Fianna Fáil and potential Taoiseach-in-waiting accepted an invitation from Carragaline Yacht Clup to attend a ceremony, give a speech and unveil a monument (in the form of a pirate ship!) to commemorate Drake’s association with the area. 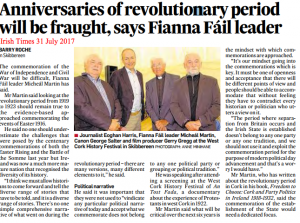 You may ask what kind of a “leader” of a major political party is so ignorant of, or indifferent to, the history of his country that he would unveil a monument to a monster who was at once a pirate, a war criminal and a mass murderer of Micheál Martin’s own people? Years, decades and centuries may come and go, old antagonisms may fade and die, but how long will it be before a Czech politician of any standing unveils a monument to commemorate Horst Borme’s association with some Czech region? Or till a French dignitary celebrates associations with Adolf Diekmann? Only in Ireland!